National Institute of Technology, Andhra Pradesh has advertised in THE HINDU newspaper for recruitment of Adhoc Teaching Faculty Plus Adhoc Non-Faculty jobs vacancies. 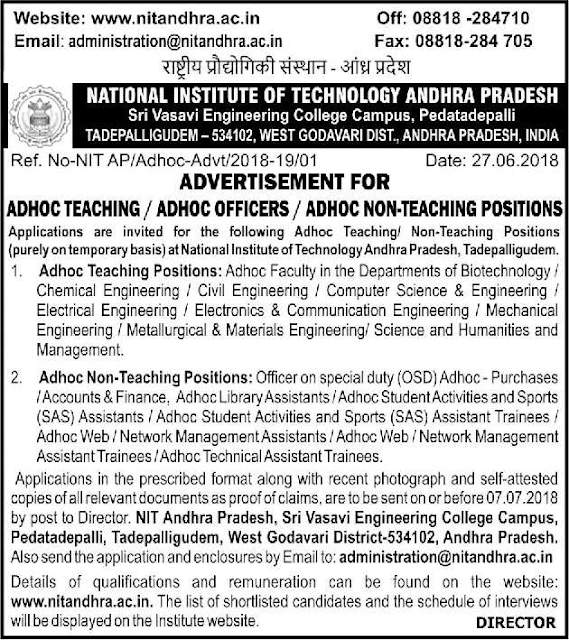 Interested and eligible job aspirants are requested to apply on or before 07th July 2018. Check out further more details below. About College : National Institute of Technology, Warangal (Deemed University) , formerly known as Regional Engineering College, was established in 1959.Pandit Jawaharlal Nehru laid the foundation stone for this institute on October 10, 1959, the first in the chain of 30 NITs (formerly known as RECs) in the country.The Institute is well known for its dedicated faculty, staff and the state-of-the art infrastructure conducive to a healthy academic environment.The Institute is constantly striving to achieve higher levels of technical excellence. How to Apply: Interested and eligible candidates are requested to send their application in prescribed format along with copies of certificates, testimonials and recent Passport Size photograph to the postal address mentioned below. Also send application with enclosures to the given email address.